With four plays by William Shakespeare currently on the boards at Ashland's annual Oregon Shakespeare Festival, the Bard of Avon is being nicely served at the yearly celebration of theater that draws thousands from the Bay Area every summer. As usual, some of the productions are stronger than others, but with a total of eight shows currently being staged and with two more scheduled to open in July, there is plenty to choose from between now and the festival's closing in late October. Of the four Shakespeare plays--As You Like It, The Tempest, Romeo and Juliet and The Taming of the Shrew--the first two are pleasant enough, and the "dead teenager play" is a must-see, cleverly tinkered with and visually exciting. But The Taming of the Shrew is nothing short of magnificent. Ironically, the best show of the OSF 2007 season is not by Shakespeare at all, but by August Wilson. Gem of the Ocean is the late Philadelphia-born playwright's penultimate work in his epic 10-play cycle telling the African-American story in each decade of the 20th century. Gem, which Wilson wrote late in the project, is chronologically the first, taking place in 1906, a little more than 40 years after the end of slavery in America. It is Wilson's most beautiful, spiritual and poetic work, and compared with some of his other plays, such as Ma Rainey's Black Bottom, Fences, The Piano Lesson and Seven Guitars, that's saying something. As directed with gorgeous detail and musical timing by longtime OSF director Timothy Bond, this production of Gem of the Ocean is alternately thrilling, moving, dazzling and devastating. 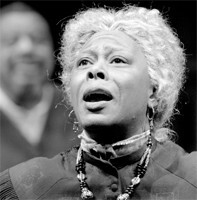 Aunt Ester (the great Greta Oglesby, never better than in this role) is a spiritual adviser to the struggling black community in Philadelphia's Hill District. She claims to be 285 years old and is rumored to have the power to wash men's souls. In need of some soul-washing is Citizen Barlow (Kevin Kenerly). The son of a former slave, this troubled young man shows up at Aunt Ester's front door claiming to have killed a man. With the assistance of her protégée Black Mary (Shona Tucker), "gatekeeper" Eli (Josiah Phillips) and longtime friend and former Underground Railroad conductor Solly Two Kings (G. Valmont Thomas), Aunt Ester takes on the task of transforming Barlow into a true citizen. To do so, he must be imbued with a sense of his people's history, which, under Aunt Ester's wise-minded guidance, involves a trancelike trip to the underwater City of Bones on a mystical slave ship called the Gem of the Ocean. The mystical elements, which have sunk some other productions of Gem (ACT's 2006 San Francisco production was one of the victims), are staged by Bond with spectacular sensitivity and confident stagecraft. The text is crammed with lovely dialogue and stocked with memorable characters, including Black Mary's dangerously ambitious brother Caesar (Derrick Lee Weeden), whose job as the Hill District's constable has put him at odds with his community and his own soul, and the affable white peddler Rutherford Selig (Bill Geisslinger), whom Ester calls upon in times of need. Though rooted in the black experience and the historical conditions under which black Americans made the shaky transition out of slavery, Wilson's play ultimately transcends race and time with its multilayered messages of personal empowerment and forgiveness. As Ester says, "You gotta be right with yourself before you can be right with anyone else." OSF's Gem of the Ocean does everything right. Another non-Shakespeare production worth mentioning is the world premiere musical Tracy's Tiger, based on a short story by William Saroyan and directed by Penny Metropulos. Born from the rhythms of beat poetry and steeped in a hot, steamy brew of what Richard Brautigan once called American loneliness, Tracy's Tiger is a rambling, heartfelt poem staged as a musical theater piece. Thomas Tracy (Jeremy Peter Johnson) is a young man who has an invisible tiger (René Millán), who appears to him as part tiger, part Zoot-suited hipster. Full of dreams and upwardly mobile, Thomas works at a San Francisco coffee company, where he meets the sweet-natured Laura Luthy (Laura Morache), the only other person he's ever met who also has an invisible tiger (Nell Geisslinger). Their fledgling love affair is scuttled when Thomas makes a major mistake (he kisses Laura's mother) and finds himself at odds with his tiger-soul. His loss of direction and the eventual journey back to his tiger manages to be deeply powerful without ever making logical sense. Though a bit longer than necessary, with a couple of songs that do nothing to move the story along, the play effectively uses its jazz-tinged music to potently set the atmosphere. There are those who will not get Tracy's Tiger, and dismiss it as a failure. It does not play by the rules of traditional musicals, certainly, but since its roots are in poetry, it is not meant to. The best poems of the beat era, from Howl on down, eschewed the rules in order to spin emotions that work beyond and above the rules. Tracy's Tiger is like that. Emotionally flat from beginning to end, The Tempest, performed on the OSF's large outdoor stage and directed by outgoing artistic director Libby Appel, is the big disappointment of the summer. The cast is fine, especially Derrick Lee Weeden as Prospero and Dan Donohue as the miserable slave-monster Caliban, but the attempts at Cirque du Soleil acrobatics are cramped and embarrassing, the spirit Ariel (Nancy Rodriguez) is burdened with a pack of "shadows" who look and act like a bizarre, Goth-Egyptian hippie cult, and the overall pace is maddeningly slow when it should be fast, and--especially in Prospero's famous show-ending farewell speech--hyperfast when it should be calm, convincing and rich with emotion. Romeo and Juliet, directed by incoming artistic director Bill Rauch, fares better, but also suffers from unfortunate pacing, particularly in the famous blood-soaked last act. Rauch's generation-gap vision of the play is fascinating, with the older generation mostly dressed in authentic Elizabethan costume and the teenagers garbed in parochial school uniforms and tennis shoes, looking like they leapt off the stage of Spring Awakening. The collision of young and old is reflected in everything from the music (Elizabethan tunes powered by hip-hop scratching and techno beats) to the way the language is spoken, with the older characters affecting a more classical handling of the text while the young ones rip through their speeches like they were contestants in a poetry slam. As the doomed young lovers, Romeo (John Tufts) and Juliet (Christine Albright) are appealing and believable, though the quick pace of the show makes their rush to suicide less tear-inducing than it probably should be. Romeo and Juliet also make an unscheduled appearance in the opening moments of The Taming of the Shrew--as Punch and Judy puppets. The sight of a comically violent R&J wailing on each other another with sticks ("Soft! What light through yonder window . . . ow!") perfectly sets the stage for Shakespeare's famous battle of the sexes, as Petruchio (the charming scallywag Michael Elich) weds the hot-tempered Katherine (Vilma Silva), and attempts to tame her wild side with a series of tricks and manipulations. Brilliantly staged by director Kate Buckley, this Taming of the Shrew leapfrogs over its more disturbing misogynist elements by making Kate and Petruchio's attraction to one another mutual, immediate, obvious and electrifying. It is lust at first sight, and the rest is just two inexperienced, eccentric lovers figuring out how to behave together. Entertainingly packed with bits of business and surprising characterizations (Sarah Rutan is especially good as Katherine's spoiled sister Bianca, and Santa Rosa's Shad Willingham as her clueless suitor Hortensio is hilarious), the real magic in this wonderful Shrew is watching the mismatched couple fall hopelessly and unexpectedly in love. As Shakespeare says, "Of all the mad matches, never was the like." Rarely has this tricky trifle been staged so madly, so likably and so well. For information of the full OSF schedule, running now through Oct. 28, visit www.orshakes.org..